Very professional. Great bedside manner. Didn't make me feel rushed at all, answered all my questions and asked me aboutmyself. Very professional. Great bedside manner. Didn't make me feel rushed at all, answered all my questions and asked me about myself. My appointment with Dr. McLeod was a positive experience--very professional, knowledgeable, and friendly. Dr. Michael McLeod is a dermatologist who is certified by the American Board of Dermatology. He earned his medical degree from the University of Miami and completed an internship in internal medicine at Yale-New Haven Hospital. He further went onto complete his residency in dermatology at the University of California, Irvine. 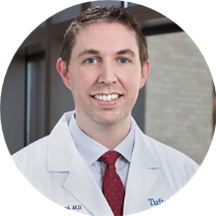 Dr. McLeod practices at Tufts Medical Center - Dermatology, catering to the needs of the people in Boston, MA. He is renowned for providing thorough medical care for the treatment of a host of conditions, which include acne, skin allergies, rosacea, and other fungal infections. His compassionate nature aids in enabling the patients to ease up and discuss candidly all the issues they’re facing. Dr. McLeod’s philosophy of skin care is simple: it should be easy, intelligent, and safe, and help you feel great not only on the outside but the inside as well. He focuses on a thorough and results-driven approach to skin care, utilizing the latest medical advances to gently lead the patient on the road to seamless recovery. Great guy. Does more complicated derm- not surgical procedures. Super fast - in and out! Great bedside manner, and was training some younger doctors, which was nice. Will be back in the future for skin screenings and any issues that I may have. Dr. McLeod was very friendly and did an excellent job of explaining his diagnosis as well as the different treatment options. He was my second opinion regarding this issue, and I'm very thankful I chose to get a second opinion! I highly recommend. Amazing kind and super thorough. Exceptional bedside manner. Dr. McLeod was fantastic! The visit I had was prompt, and he was ultra professional. I would recommend him 10/10 to anyone seeking a Dermatologist. I was a bit late and was impressed with how quickly and professionally I was welcomed. The appointment was quick, informative, and very helpful. Dr. McLeod is great! He has a great bedside manner, and the whole exam was very consent-based in terms of asking to examine the things I had concerned about. I highly recommend. Knowledgeable, respectful, cheerful and friendly. Professional internist as well. A nice find! I cant say enough about Dr.McLeod and his team. From the receptionist to the physicians assistant, everyone was beyond pleasant to be around. I left feeling more than satisfied with my visit.